One of you lucky ladies will have the change to win yourselves a Wimbledon headband! I have had one myself for a couple of year sand really like mine; it can be both sporty and preppy, cute or elegant at the same time, depending on how you style it! Eka wear is ecological, ethical, vegan and hand made. They make knitted acessories for both me and women as well as some interior items too. You can and should read more about Eka and the way the products are made HERE! Visit the site at ekawear.com and the shop here. 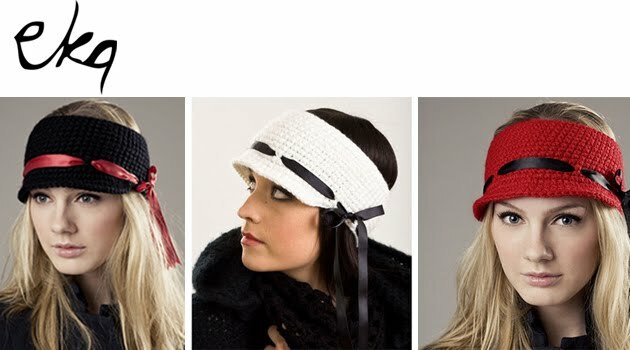 The winner can choose the headband between the four available combinations: Red with Black Ribbon, Brown with Mint Green ribbon, White with Black Ribbon or Black with Red Ribbon. So, to enter the give away, visit me here on freelancersfashion.blogspot.com directly and leave me a comment on this post. You don't have to be a follower of my blog to participate, but really, if you just googled "give away" to end up here then maybe you shouldn't bother. The winner will be drawn randomly so please leave me only one post per comment. However, if you tweet/blog/mention and link to this post you may get another entry by leaving me a second comment about it, linking to the mention. Be sure to have your profile available or that you leave me an email so I can reach you! You can enter no matter where you are located. The give away is open until Friday night next week; November 4!